Easter crafts don't have to be complicated to be appreciated. You can make wonderful yet simple decorations and gifts you can use to celebrate the holiday. 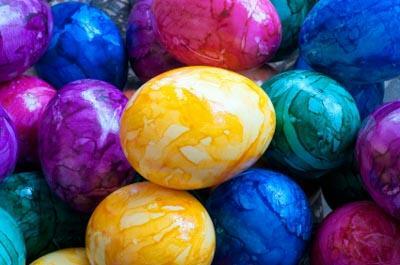 The following Easter crafts offer a range of fun and easy projects that are suitable for kids (with minimal adult supervision) or anyone who prefers simple crafts. For the best results read through the instructions carefully before you purchase your supplies and begin your projects. If you need help downloading the printable instructions, check out these helpful tips. You'll enjoy the result of this project for many years to come. 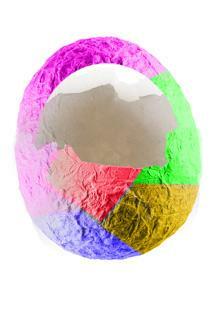 One sheet of Easter or spring-themed scrapbooking paper of sufficient size to fill the frame. Place a strip of double stick tape no longer than the length of the greeting card in the center of the scrapbook paper. Hold the card centered over the scrapbook paper, and gently press it to the tape. Remove the back of the frame, and lay the card and paper face down against the glass. Replace the back on the frame. If you like, you can also embellish the frame by hot gluing small silk flowers around the edge of the frame. These bookmarks can be given out as favors at Easter dinner, or you might organize this as a craft to keep the youngsters busy at your celebration. Starting from the 8 1 /2-inch side, cut 2-inch wide strips from the sheet of card stock to make basic bookmarks. Decorate each each bookmark by drawing Easter-themed symbols like colored eggs, chocolate bunnies, crosses, etc. Alternatively, you can decorate each bookmark with Easter stickers. Punch a hole near the top of the bookmark and tie on some decorative ribbon, yarn, or a tassel for a finishing touch. This craft is easy enough for children to make to hold their prizes from the Easter egg hunt, but you can also make them yourself and fill them with goodies for the kids. Add each child's name to his or her bag. Decorate each bag as desired. Add a little Easter grass in the bottom for cushioning. 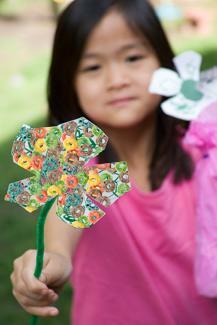 Kids will enjoy making these fun flowers to take home from your celebration. Use a green marker to color each popsicle stick for the stems. Tape a stem to the back of each flower. Color a circle in the center of each flower. Glue pieces of cereal to the petals in any way that seems pleasing. Easter coincides with the beginning of spring and the return of butterflies. Make one or more of these butterflies to decorate your home for the holiday. 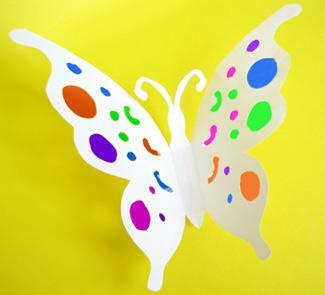 Use this printable butterfly template and cut out a pattern of shapes within the wings. Cut out the butterfly shape from a single piece of cardstock. Color in the body with the black marker. Cut out various shapes like circles (or whatever you prefer) from the inner areas of the wings, leaving some cardboard space between them. Cut pieces of tissue paper that are about 1/2 inch larger than the cut out areas, and glue them to the back of the butterfly over the open areas. This creates colorful patches on the wings. When the glue is completely dry, tape the butterfly to a window so the light shines through the tissue. Making your own Easter basket is a fun way to celebrate the holiday and a much cheaper alternative to buying expensive specialty baskets each year. Blow up your balloon and tie it shut. Attach a string to the end of the balloon. Tear several strips of newspaper approximately one inch wide. Fill your pie tin with liquid starch or the paper mache paste recipe of your choice. Drop the newspaper strips into the liquid starch, then wrap them around the balloon. Overlap the strips slightly, making sure the balloon is completely covered except for the knot at the end. Hang the balloon by the string in a safe location. Let dry completely. Snip the knotted end of the balloon and remove the balloon from your paper mache ball. Cover the hole where your removed the balloon with more paper mache strips. Draw a zigzag or scalloped line around the middle of the balloon to mark the top of the basket. Draw a pair of parallel lines over the top of the basket to make a handle. Cut out the enclosed areas to form your basket. Paint your basket as desired. 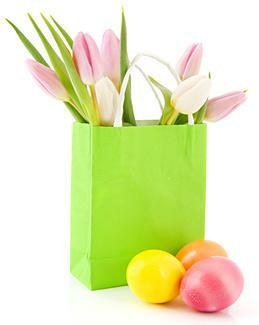 The Easter holiday can be one of the biggest highlights of the year. These super easy craft projects will provide entertainment as well as decoration for your celebration. 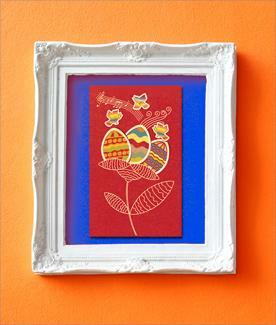 If all goes well, you may even want to make Easter craft projects part of your family tradition.